While Belarus has suffered more than any other country from the Chernobyl disaster, it receives little foreign aid because of its political isolation. In addition, all the Soviet-type bureaucracy and red tape limit development of community initiatives and civil society projects in Belarus, particularly those which involve foreign aid. When on 26 April 1986 the Chernobyl nuclear power plant exploded, the winds were blowing in the direction of Belarus. As a result, more than 70% of the radioactive fallout landed in the south-east of Belarus. One-fifth of Belarus’ farming land was severely contaminated. In 1986, the Soviet Politburo led by Mikhail Gorbachev was concerned more about its reputation than about lives and health of Soviet citizens, who were primarily living in the territory of Belarus. There was nearly no publicly available information about the blast and people marched in traditional 1 May parades with red flags, praising the Communist Party and exposing themselves to high doses of radiation. Only after radiation levels set off alarms in Sweden, over one thousand kilometers from Chernobyl, did the Soviet Union officially admit that an accident had occurred and began to share more information with the public. Many illnesses and deaths could have been prevented had the authorities in a timely manner taken the most basic precautions, such as distributing iodine, a treatment which prevents the effects of radiation. As a result, Chernobyl resulted in thousands of deaths, and a much higher number of cases of cancer and other radiation-related illnesses. 25 years later, Belarusian authorities led by Alyaksandr Lukashanka seem to have a two-fold approach. At home, they often argue that the effects of Chernobyl are exaggerated and much of the polluted territories are safe to use for agricultural and other purposes. Dealing with the Chernobyl consequences is costly and clearly undermines the Belarusian authorities’ decision to build a nuclear plant station close to the border with Lithuania. Because of the Chernobyl legacy, the idea of building a nuclear plant station is unpopular in Belarus. However, the Belarusian parliament is not independent and the civil society is too underdeveloped to influence this decision. Just yesterday, the authorities detained a group of people who were going to protest against building a nuclear plant in Belarus. They also banned Charnobylski Shliakh – an annual rally to commemorate the nuclear disaster – but allowed a meeting outside of Minsk city center. Abroad Belarus authorities often take a different approach. They use the Chernobyl problem to distract foreigners from the political situation in the country. For instance, in 2007 the Belarus embassy in Washington, DC organized a reception for a local chapter of Harvard Club. The stories told by the embassy representatives to Americans about birth defects and other Chernobyl-related consequences were so shocking that following that event they looked at Belarusians as though they were emitting radiation themselves. However, the ongoing political repressions in Belarus and the personality of Lukashenka hinder authorities’ attempts to raise more funds and get political backing to deal with Chernobyl-related problems. Lukashenka was not invited to a major Chernobyl donor conference in Kyiv last week, because the European Commission’s President Barroso wanted to avoid embarrassment of meeting him. Only a few lower-level Belarusian representatives were there. Today, President Medvedev of Russia and President Yanukovich of Ukraine are visiting Chernobyl, but Lukashenka will not be there. It is understandable that many world leaders want to avoid meeting Lukashenka. But perhaps the organizers of those events should have invited other high-ranking Belarusian officials not directly implicated in political repressions. It is just not right that the country which suffered the most is nearly excluded from participating in major Chernobyl-related international events. 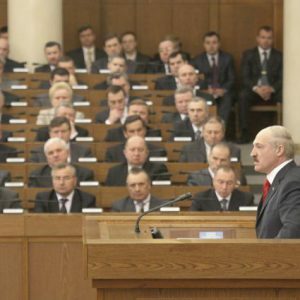 In his annual parliamentary address last week, Belarusian president Aliaksandr Lukashenka stated the need for defining a post-soviet Belarusian identity. By a way of an answer, he offered curtailing of democratic freedoms and crackdown on dissent. This echoed his New Year 2011 speech, when Lukashenka said that only those who had voted for him at the last election were worthy Belarusians, the opponent being outcast. Rather than seeking a substantial answer to the pertinent question of Belarusian national identity and that would unite the nation for the new century, Lukashenka started dividing the nation, and by force. Recent harsh sentences for opposition activists is yet another evidence of that. Until recently, Lukashenka demonstrated a superbly sharp instinct for power, which helped him navigate many precarious situations in 17 years in power. That instinct led him to produce the ideology of independent Belarusian statehood. This ideology, applied with flexibility and skill, formed the corner stone of Lukashenka’s power in Belarus, much more than cheap Russian energy. His regime did rely on coercion, but also to a great degree on consent about protecting Belarusian independence, the point to which even the opposition could not but subscribe. By the end of the 2010s, however, the idea of Belarus independence got so entrenched and constitutionalised, that another ideological boost became necessary. With a firm statehood foundation, Belarusians continued to lack a cohesive and clear sense of their national identity. Neither the 19 century nor Soviet ideas about national values and attitudes seem to hold water twenty years into the post-soviet era. Belarusians need a sense of themselves and their place in the present-day world. This, Lukashenka seems unable to offer. It is very unlikely that purging ”good” Belarusians from the “bad”, will by itself yield Lukashenka the desired national identity. It may appear easier to preach to the converted, at the first sight, but one still needs to know what to say and what vision and goals to set to the audience, beyond further social policy spoils as the president has done so far. Not is only Lukashenka’s tactics time-delaying at most as regards social progress, it is also self-destructive. The approach of keeping unity but excluding dissent is unfruitful as it can eventually eliminate everyone out down to the last man. A unifying ideology, instead, the one that finds place for diversity and dissent, can survive through the ages, and thrive in different economic conditions. Lukashenka does not seem comfortable with the idea though. Or perhaps he has reached his depth? Four scenarios are likely to play out in Belarus in the short to medium term. The most likely one is the continued polarization of society and regime’s increased reliance on coercion rather than consent. This would involve economic austerity, protectionism and parazyting on the country’s transit status, under Lukashenka’s continued grip. Another possibility is the emergence of a credible opponent that would pick up where Lukashenka has left in ideological terms and offer the society a unifying concept of national identity. A quick regime change by popular pressure will ensue, most likely in a more democratic direction. The social basis for such an ideology is consolidating, it remains to be the question of the right individual with the right agenda coming to the fore without his activity being nipped in the bud by the current Belarusian authorities. Yet another possibility is Lukashenka’s concentrating and pulling out a credible – and unifying – national identity himself. Unless it has viable ways of incorporating dissent, however, the ideology would not last. The possibility is small, but should not be ruled out entirely. Lukashenka’s ability to play this scenario will depend on his perception of the vulnerability of his position and having an intellectual range of available solutions at hand. In this case, Belarus would become a neutral state trading equally with Europe and Russia, with a more relaxed and relatively legitimate regime, though not a liberal democracy. The final one is Russia’s coming to buy up Belarus’s family chest, which would not, however, result in the loss of political sovereignty but will forestall any meaningful economic reform and progress. This scenario may well combine with the first one. As long as Lukashenka continues dividing Belarusians into the “proper” and “improper” ones, he is losing ground as a credible and genuine national leader. The more the balance of his power basis tilts from ideological consent to political coercion, the more vulnerable his hold over Belarus becomes. Natalia Leshchenko, PhD is an expert in political ideologies and national identity at the Institute for State Ideologies (INSTID) in London.